The cost of transmission service, be it repair or replacement will vary depending on the issue and the make and model of your car so it makes it hard to pinpoint a cost. As a ballpark you might be looking at $200 – $500+ for basic repairs and if the job is a big one and requires complete replacement, you could be looking at anywhere from $1000 to $5000+. As we always say, regular servicing of your car can help to avoid an issue such as a transmission replacement allowing your mechanic to catch any problems early, but some people get very unlucky. So here’s a little about transmissions so you know what we’re working with when you come in. Transmission is the part of the engine that talks to the wheels. Essentially it “transmits” the power from the engine and makes the wheels turn. 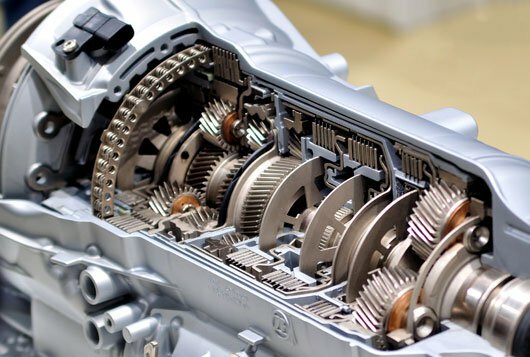 Transmissions come in a variety of forms, the main being Manual and Automatic, but there are also Dual-clutch, Semiautomatic and Variable transmissions. Whatever type of transmission your car has, it will be filled transmission fluid which provides lubrication and cooling. When we service a manual transmission, we simply change the oil in the gearbox because there is no filter however an automatic transmission service requires us to change the filter that is attached to the transmission oil pump as well so the job is a bit bigger. Its really important to do this though because leaving an old filter in can result in premature wear and cause greater problems later down the line, (remember that $5000 figure I mentioned before, that’s what we want to try and avoid). How Will I Know There Is A Problem With My Transmission? What Are Some Common Problems With Transmissions? This could just be a lack of transmission fluid or it could be something much more serious. Our advice, get it checked. Automatic cars will display the engine light on the dash when they detect something wrong with the transmission. If this is accompanied by strange noises and vibrations we advise you not to drive the car any further and call your mechanic. If your car has trouble taking off from a stationary position or the engine revs and speed doesn’t increase go see your mechanic. It is possible that there is a fault with your transmission. Leaking fluid isn’t good. It could be a number of things such as oil, brake fluid, clutch fluid or transmission fluid. You know what I am going to say..get it checked. How do you check the transmission and repair? We get your car on a hoist and check for leaks or obvious cracks and other damage. We check the fluid levels and finally we check how the car is performing by taking it for a drive around the block. We then determine the issue and let you know our recommendations and price. Remember, regular servicing is recommended as it allows us to catch any emerging issues early. While servicing 6 monthly may seem like a big cost, it can help to avoid huge costly issues down the line. We are always here for advice and inspection so don’t hesitate to give us a call if you are looking for a transmission repair near you.